Fully waterproof with Twist up/twist down eycups for spectacle or non-spectacle wearers. 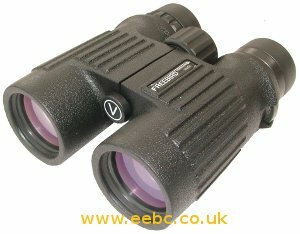 With the waterproofing, the relatively light weight, tough rubber body, and excellent optics, these are ideal for many uses including bird watching and country walking. 24/02/2011 16:46:54 I bought a pair of these off you about a month ago, I really am surprised at how good and sharp they are, I have compared them to my freinds Optic-ron and other freinds Leopold binoculars and I can not see any difference. Why are the half the price of the others I have looked at? 24/02/2011 16:57:46 The Visionary Firebird binoculars are really nice binoculars, great image and not too expensive. One of the reasons they are not as expensive as others is due to the supply chain, as I understand it (companies and their supply chain seem to be very secretive) Optical Hardware is a British company that goes directly to the manufacturers in the far east and gets their products made. Many companies in the UK, buy from a european subsiduary (which adds its margin), the european subsiduary sometimes buys from a Japaneese or American parent company (which adds its margin), so by the time they get to the dealers there is already several profits being made. With Optical Hardware, it is a more direct Factory -> Optical Hardware -> Dealer arragement. 22/11/2011 09:54:57 This is way more hlepufl than anything else I ve looked at. 22/11/2011 10:25:40 Thank you for your comments. 03/10/2013 15:42:52 I am looking at buying the Visionary Freebird binoculars. I have looked through the 8x42 which I thought had fantastic optics. However I am using them for fishing, spotting hatches, general use and bird watching. I think I would like the 10x42 for the extra power but concerned they will not be as bright as the 8x42. Obviously you have looked through both, so could you please help me ? 10/03/2013 16:11:46 The Freebird are excellent binoculars. You are correct, the 10x are not quite as bright as the 8x; more magnification always uses more light. However, seeing them both side by side, there is not much between the two, yes the 8x are slightly brighter, but not by much. On a bright day, you would probably not notice between the two, on a (very) dull day then the 8x image is just that little bit better. We have them both in stock, if you want to see them both side-by-side.